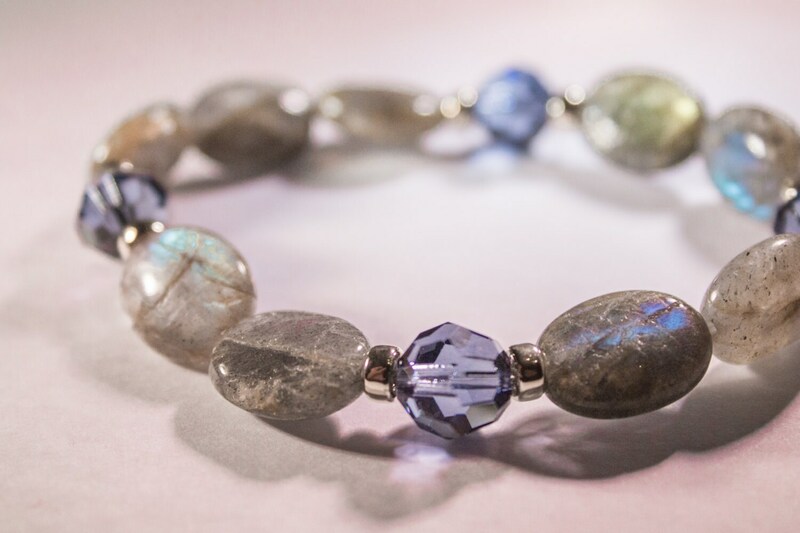 This genuine Labradorite gemstone, Swarovski crystal and 14k gold-filled or sterling silver bracelet has been energetically cleared and infused with the blessings of Allowing & Receiving. Have you ever received a compliment that you didn’t believe was true, and you just brushed it off? What if that compliment was coming from someone who knew and truly saw that in you, but you denied it? These jewels can help you to dissolve the blockages of disbelief and unworthiness. Allowing is being open to possibilities. This blessing will help you to be more open in your life. Those places where you have closed doors in your life can be shifted and opened, ever so gently, if you truly choose this. By not being in allowance, we keep the doors closed that could bring so much more magic to our lives. Receiving is our ability to let in, to take in and experience. When we do not receive, such as that compliment, we deny ourselves the connection and experience of who we really are. That energy is an indication of feeling selfish or unworthy. By choosing to receive, in the unlimited ways that are possible, we shift the beliefs of the past. This Allow & Receive blessing will assist you in expanding and opening up the most amazing, magical possibilities in your life. What if allowing and receiving was no longer difficult or denied in any way? How much more glorious could life be? Are you ready and willing to allow and receive, and find out what is behind those closed doors? We invite you to step thru. The properties of the labradorite will enhance, and the 14k gold-filled or sterling silver will magnify, the infused energies of the crystals and the purpose for this bracelet. Labradorite is known for its assistance in bringing magical changes to our lives. Many have experienced access to abilities, and more serendipity and synchronicity. This stone may help in opening up and receiving more intuition and a deeper sense of oneself. It has been known to help people to recognize their connecting with their mental capacities with greater awareness. Labradorite is a stone of transformation. The more we allow and receive, the more transformation we experience. This stone will help you clear and balance yourself, thereby creating more space for what you are ready to allow and receive. This bracelet has been programmed to adapt to your individual needs, and will continuously receive unlimited sacred energy. The energy will never "wear out," and the bracelet will not absorb any negative energy, so it never needs to be energetically cleared. If at any time in your journey, you are knowing or sensing that you are not experiencing all that is possible, you can choose in every moment to release the blockages and allow yourself to receive..
COLOR: Labradorite, Denim Blue Swarovski Crystal and Sterling Silver or 14K Gold-Filled. All gemstones are unique, and color can vary. SIZE: Crystals are 10mm, Labradorite are 10 x 14 flattened ovals. Please select 7", 8", or 9". Design may vary somewhat based on size. Pictured are 8" silver, 7" silver, 8" silver and 9" silver. Packaging shot features an 8" gold. Length is linear, please allow for depth of beads. Stretch cord for ease.